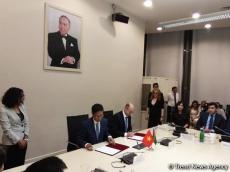 Azerbaijan and Vietnam signed a protocol of the second meeting of the joint Intergovernmental Commission on economic, trade, scientific and technical cooperation in Baku on June 20. The protocol was signed by the Commission’s co-chairs – Azerbaijan’s Energy Minister Parviz Shahbazov and Tran Tuan Anh, Vietnam’s Minister of Industry and Trade. The document covers cooperation in a number of areas, including trade, investment, energy, agriculture, transport, communications and high technologies. During the meeting, Shahbazov noted that Azerbaijan and Vietnam have a great potential for the development of cooperation, which should be fully used. The minister added that the countries intend to expand bilateral relations in various fields. Tran Tuan Anh, in turn, noted that Azerbaijan and Vietnam have the potential to develop cooperation in many areas. The trade turnover between the countries amounted to $101 million in 2017. The export of Azerbaijani goods to Vietnam accounted for $55 million, while the export of Vietnamese goods to Azerbaijan totaled $46 million. During the meeting, the sides also discussed the possibilities of cooperation in such areas as the use of new technologies in the oil and gas sector, the rational use of energy and the use of renewable energy sources. The diplomatic relations between Azerbaijan and Vietnam were established on September 23, 1992, and Azerbaijan opened its embassy in Vietnam in 2013. Trade turnover between the two countries amounted to $15.86 million in January-April 2018, according to Azerbaijan’s State Customs Committee. The export of Azerbaijani products to Vietnam accounted for about $630,000. During the year, the trade turnover between the two countries increased by 65.2 percent.